When you present a lot of homeschooling workshops and presentations, you are plagued by the things you left out of your talks and questions you didn’t have time to get to. It’s like being in a situation where you need a snappy comeback, and as soon as you leave the room, what comes to your mind is the perfect thing you should have said. This year, as one of three featured speakers, I presented four talks at the 2016 VaHomeschoolers Conference and Resource Fair, a record number for me at this conference. Invest on the front end / Invest on the front end / Avoid scrambling later / Invest on the front end. How could I forget this? I’ve remembered to use the little ditty when I presented this session previously. But – I had so many fun things to talk about during this presentation, and I had photos of homeschooling houses and educational furnishings to share. It’s so easy these days to project photos of nature tables and homeschool rooms and reading nooks right into the theater! We were supposed to sing it together. 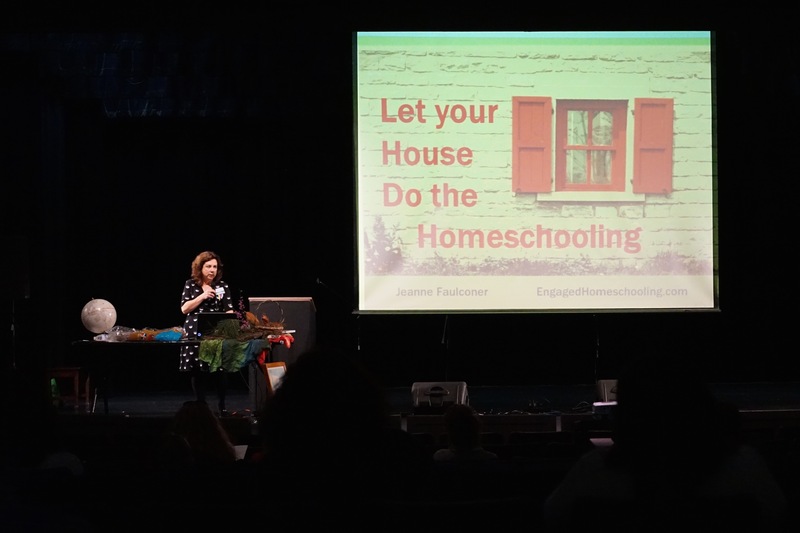 After I got home from the conference, I also received an email related to “Let Your House Do the Homeschooling.” Kim Sorgius of the Not Consumed blog gave me permission to use the photos from her article, “The Tale of Two Homeschool Rooms,” in my PowerPoint presentation. Alas, I received her email in that famous recovery period which conference volunteers and travelers know as A.T.C. – After The Conference. However, I had included the link to the Not Consumed website in my handout for that session, which I could do without violating copyright of her photos. Now you have the link here, and you can read the article, see her photos, and see how her thinking has evolved as far as setting up a school room in her home. While Kim’s is a Christian site, her photos and article on this topic, “The Tale of Two School Rooms,” are interesting regardless of your faith. A quick glance through my evaluations after the “Let Your House Do the Homeschooling” session told me that in a sea of high marks and great comments (thank you! ), at least one person found the session “too general” and wanted more specific ideas — while another person in the same audience found the session “too specific” and wanted something more general, so she could customize her own specific ideas. This is sort of like being a reporter and writing a story that makes both Republicans and Democrats feel you are biased against their party and favoring the other party. Each homeschool conference session has both divergent and linear thinkers. Each session has audience members who want the speaker to provide them with a written outline in the handout or who want you not to provide such an outline. And each session has someone who wants you to be more general – and someone who wants you to be more specific. And so it goes, the perfect metaphor for why learning at home should be customized for each family member. You can please many of the people much of the time, but not all of the people all of the time. And some of your people will be pleased by opposite things – which goes for the young learners in your homeschooling family as well. In my presentation, “That’s How We Role: Ideas for Working Out Earning and Learning,” we talked about the many ways people put together lives that include homeschooling, work, and other responsibilities. My handout for that presentation gave a lot of links to articles about working moms, homeschooling dads, and single parents who are homeschooling, and there was another article I wanted to refer my audience to – but it hadn’t been published yet. That was my interview with Angie Cutler about “office schooling.” Angie takes her nine-year-old daughter to work and homeschools her in the office of their family-owned business. She doesn’t work from home, and this is a full-time, ongoing, professional business. And it’s working out. They are truly office schooling. In “Writerly Writing: A Writer’s Approach,” I found myself with a sprawling session that gave an overview of my whole approach to growing writers at home and in homeschool co-ops and classes. Typical of an umbrella-type session, I could have spent an hour each on about five different sub-topics within my talk. When I took questions, it was gratifying to hear that even though I’d been speaking broadly, people were picking up on the ideas that they could apply to their families. I advised parents to play word games, read and write poetry, do freewriting, de-emphasize revision until children are older, make writing social, and help children connect with authors and with being authors themselves. I’m really disappointed I didn’t show this slide, because it undergirds the whole message of that presentation. As homeschooling parents, we must not look so far ahead to what we hope our children will accomplish that we miss who they are today. Being seen as not measuring up over and over and over again has a negative effect on children – and on their writing. They will shut down and not risk doing anything if what they do is surely going to be seen as either not enough or not good enough. This does not mean we need to emphasize praise or artificially inflate what we say about or to our children. That extreme won’t produce the desired result either. Kids don’t get better when we are dishonest, but they also don’t get better when they feel like they will never be judged worthy of our acceptance. In fact, the concept of “growth mindset” (Google it) tells us that labeling children as smart and excellent learners can have damaging effects too, since kids with those labels often actively avoid learning opportunities that could jeopardize their record of success – or experience crippling anxiety in what feels like a risky situation. Which brings me to my fourth conference presentation – “Side-by-Side Homeschooling: Connected Learning.” Here I talked a lot about what I’ve been researched about brain-based learning. Just like I spoke about in the “Writerly Writing” session, I mentioned that creating a low risk/high challenge environment for learning is one of the things that’s important in homeschooling if we want to maximize academics. That’s according to the book Making Connections: Teaching and The Human Brain, a book by Renate Nummela Caine and Geoffrey Caine, one of my favorite books about learning, which I used in developing my talk. Here we have the coming together of all my talks, and I wish I could have physically Venn Diagrammed the topics of my other sessions into the big circle of “Connected Learning.” I covered highlights on what we know about brain-based learning, and it turns out that research shows that academic learning does not occur independently. Academic learning totally takes place in the context of relationships, physical environment, interests, feelings, and physiology – among other things. Setting up your home to be a better homeschooling space, like we discussed in “Let Your House Do the Homeschooling?” That’s actually an element of brain-based learning. Creating a high-challenge/low risk environment for writing – or any other subject? That’s actually an element of brain-based learning. Managing the roles of homeschooling and work so that parents can connect to their children? That’s actually an element of brain-based learning. Not only in all of my conference sessions, but everywhere I turn these days, I see that homeschooling can create a positive environment for learning, because in our homes, in our families, we do not have to use an institutional approach that is frequently at odds with what we know about how people learn. So if I physically could have shoehorned my other sessions into this one, so we could have all felt the umbrella of connected learning, that’s what I would have done. And I would have done one more thing. In a chat with a new homeschooler after the conference, I heard that while she was inspired by her time at the conference and all the presentations she heard, she also felt, in a way, that she might not measure up. She told me she’s not like the homeschoolers who were making presentations – not as good at crafts and not as good at making things interesting for kids. She said she really doesn’t want to homeschool as much as she wants the best for her child, and she believes that homeschooling is far better than what her child was experiencing in public school. While she doesn’t actively dislike homeschooling, and she loves spending time with her child, she’s just not as into it as the conference speakers are. “I think ya’ll need to get some underachiever moms to speak at the conference so people will feel more normal when they listen,” she messaged me. “Just kidding,” she added. So, if I could go back and add to what I said at the conference, I’d make it clear that the struggle to homeschool even along my own ideals is just that – a struggle. Many days during what is now my 19th year of homeschooling have involved my questioning myself, my inadequacy, my impatience, my doing something other than what I’d recommend to someone else. Yes, we’ve had our magical days and moments of snuggled reading and amazing projects and original music/code/debate. But we’ve also had our stormy days and moments of doubt and exhaustion and failed experiments and I-don’t-want-to-do-this-any-more. Which makes me cling ever harder to stuffing our homeschooling under the Venn Diagram’s circle of connection. Because reality, my friends, includes anxiety and parental all-nighters and misspent curriculum money and lost library books and kids playing way more video games than you ever expected when you embarked on this homeschooling deal. And actually, a few years ago, I did do a conference session called “Homeschool Reality,” about the disappointments, the difficulties, the gut-wrenchingness of homeschooled kids who, like their schooled peers, sometimes make bad choices or can’t find their way. At a conference, we have the opportunity to share and learn from one another’s good ideas. Speakers have less than an hour to express their ideas, so the natural emphasis is on what works, what might work for someone else. This picture of homeschooling leaves out the knotted hair and the sink full of dirty dishes and the workbook that was ripped in half by a frustrated child. Or a frustrated parent. One of the problems inherent in blog posts, articles, and conference sessions about homeschooling is that many of us are unwilling to make our children — or ourselves — the subjects of an ongoing reality show. This is wise, I think, since kids don’t deserve to have a role thrust on them in which they must be poster children for homeschooling (or for anything else, for that matter), especially with their problems highlighted in great detail. Many homeschoolers generously offer little windows of what homeschooling is like. However, most homeschoolers use some care so as not to burden their children by making weaknesses or mistakes so detailed and public that the kids are plagued by in-depth public knowledge of their shortcomings. It can be a difficult balance. That said, you can rest assured that experienced homeschooling parents don’t reach perfection. They might develop an extra bag of tricks. They might develop a cohesive philosophy of education. They might know how to organize a co-op or a park day. They might know all the best historical fiction books to pair with a middle school study of American history, and for me, it’s especially intimidating when they can also throw in a craft to accompany each book. But in the end, we’re all just parents trying to do the best we can. We won’t always get it right, and our kids definitely don’t live in a perfect homeschool world. As I’ve said before, there is no homeschool guarantee. It was a great conference, and I said a lot of things across four sessions, but I wish I’d said that again, too. I’ll speak next at the LDSHE East Conference May 25-27, 2016 in Ellicott City, Maryland. My topic for the Beginners’ Seminar will be “At Home Instead: Deschooling and Making Your House Work,” and my topic for the general home education conference will be “Engaged Homeschooling.” Maybe I’ll see you there! This entry was posted in Conferences and Workshops, Engaged learning, Homeschool Guarantee and tagged 2016 Homeschool speakers, After the Homeschool conference, beginning homeschoolers, Conference Afterthoughts, Conference presentations, Conference talks, Connected Homeschooling, Engaged Homeshooling, experienced homeschoolers, homeschool advocates, Homeschool conventions, Homeschool guarangee, homeschool presenters, Homeschool reality, Homeschool speakers, Homeschool struggles, homeshool convention speaker, inclusive homeschool conference, LDSHE Conference, Let Your House Do the Homeschooling, office schooling, Side-by-Side Learning, speaking, VaHomeschoolers, VaHomeschoolers conference, What I wish I'd said at the conference, who can tell me about homeschooling, Writerly Writing on May 15, 2016 by Jeanne Faulconer.